This program looks at two waves of the form ASin(BX+C) and graphs their interference pattern. A program containing a digital timer and a digital and analog clock. A VERY upgraded version of Mnemon with better interface and remembering utilities. A 3D engine that draws rectangular prisms (any size, solid or transparent) on the graph screen using pseudo-one-point perspective. Also includes Cubes, a simple program that shows what it is capable of. A simple conversion system between bases 10 and 2. 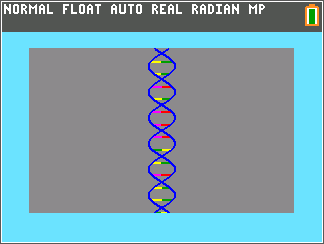 A program that asks for a DNA or RNA sequence, then gives the complementary sequence and displays it! This program is intended for teachers or anyone who wants to grade tests or exams. It is one of the first programs that I have written, but it is constantly being improved. Version 3.5 has a better user interface, and improved control. This is the Solitaire Encryption algorithm that Bruce Schneier made for Neal Stephenson's book Cryptonomicon. Before, only a TI89 version of the program existed. This is for the TI83/84s. Give your calc some time, and eventually something will come out encrypted/decrypted. The outputs are stored in Str1 and the decryption deck is stored in ∟DDECK.